After retiring at the age of 59, Chuck Aldridge, an Asheville resident, decided to thru-hike the Appalachian Trail in 2011. Now's your chance to get helpful tips and hear stories about thru-hiking the AT from a fairly different perspective. Chuck will talk about how to start, how to stay, how to keep going, and how to finish the Appalachian Trail during his presentation at the Asheville REI on May 24th, from 7:00 p.m. - 8:15 p.m. The event is free, but appears to be filling up fairly quickly. For more information, please click here. Train passengers experience travel unlike any others; they get to see the vastness of the American landscape more intimately when traveling by rail, from cities big and small, to country vistas and everything in between. In honor of the fifth anniversary of National Train Day, Amtrak is inviting train fans to share what they see and experience on their train journeys and enter the See More On A Train online contest. A celebration of train travel and the ways that trains touch the lives of people across America, National Train Day will take place at train stations in New York City, Philadelphia, Chicago, and Los Angeles, as well as numerous other communities throughout the nation, on Saturday, May 12, 2012. Award-winning actress, writer and philanthropist, Rosario Dawson, will serve as spokesperson for the Fifth Annual National Train Day, sharing her love of train travel and how it allows her to be involved in the community in a more personal way with train fans. From now through May 29, 2012, train fans can upload their original photos, videos and stories chronicling how they have been inspired by their train travel to NationalTrainDay.com for the chance to win great prizes. A Grand Prize winner in each of the three categories will have their choice of one of four provided Amtrak Vacations Tour Packages for two travelers. In addition, train fans can visit facebook.com/NationalTrainDay to participate in the National Train Day sweepstakes for the chance to win an Amtrak Vacations Package to Glacier National Park and a full Samsonite luggage set. To view the complete rules for the See More On A Train online contest and additional prizing information, or to learn more about National Train Day, please visit NationalTrainDay.com. Managers at Great Smoky Mountain National Park have announced that Look Rock Tower and the access trail will be closed May 1st and 2nd, and May 10th and 11th, in order to complete the final steps of a radio installation project. Look Rock is located off the Foothills Parkway in the Great Smoky Mountains National Park. During the closure period, installation of a new radio repeater will be completed by the Blount County Sheriff’s Office in order to upgrade the radio communications available to Blount County Sheriff’s Office and local Emergency Management Services. The work will also involve the grading and paving of the trail and access drive. 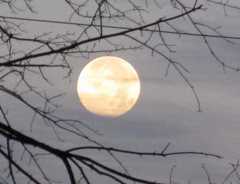 Next Sunday night, May 6th, will be the first "Full Moon Hike" of the year in Cades Cove of the Great Smoky Mountains. This is an excellent opportunity to take a stroll in Cades Cove under the light of a full moon. If interested, meet at the Orientation Shelter near the entrance to the Cades Cove Loop Road. The hike is from from 8:30 PM to 10:30 PM. Next month is Trail Days in Damascus, Virginia. Trail Days is the annual Woodstock for hikers. It’s the mother of all hiking gatherings. It’s a celebration of all things Appalachian Trail. And it all happens in tiny Damascus, Virginia, also known as Trail Town, USA where the Appalachian Trail, the Virginia Creeper and the Iron Mountain Trail slice through the middle of town. Each year Damascus becomes the destination point for thousands of thru-hikers, veteran hikers and those who just love hiking and the Appalachian Trail. It's recognized as the largest trail event in the world, and many A.T. thru-hikers will time their hike in order to be in town in mid-May for the annual three day festival. Trail Days 2012 will happen on May 18-20 this year. For more information on the event, please click here. The latest edition of the Cub Report from the Great Smoky Mountains Association is reporting that all fields in the Cataloochee Valley, and the field east of US Hwy. 441 between the Oconaluftee Visitor Center and the Blue Ridge Parkway, and the fields at Couch's Creek and along Tow String Road, are closed to pedestrian and horse traffic during the months of May and June as a result of this being the elk calving season. During calving season, newborn calves are often bedded down in the tall grass area of the fields. Closing the fields prevents inadvertent contact between visitors and calves, which could lead to disturbance of the calf and or an attack by the mother elk. 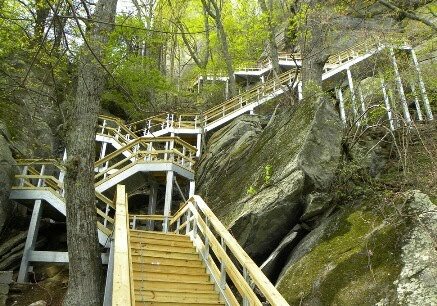 Earlier this week Chimney Rock State Park in North Carolina announced that the Outcroppings Trail is now open. After four months of challenging construction, the Outcroppings Trail reopened on April 14. The trail, rebuilt over the winter, offers new stunning views of the Park, increased capacity and improved comfort with more places to rest. The reopening of the Outcroppings Trail, which leads from the upper parking lot to the Chimney stairs, restores hiking access to the Chimney, the Opera Box, Devil’s Head and Skyline Trail to Exclamation Point, the highest point in the Park. The upgrade preserves access to the Park’s iconic centerpiece for generations while improving the guest experience. Landings are placed every 12 vertical feet of climb to facilitate rest stops, and the new six-foot-wide stairways, which increase capacity, have a gentler incline to make it physically easier for guests to hike to the Chimney. The modernized elevator and Sky Lounge Gift Shop & Deli are expected to reopen sometime later this spring (i.e. May or June). Originally opened in 1949, the Park’s 26-story elevator is nearing its completion on an extensive modernization project. Almost every part including the original elevator car is being upgraded or replaced. The Sky Lounge Gift Shop & Deli has been renovated to make its restrooms wheelchair accessible, and it will offer improved retail and food selections. Reduced admission rates as of April 14 will be $12/adult, $5/youth (ages 6-15) and free for kids under 6. To see more photos of the Outcroppings Trail Reopening Day, please click here. 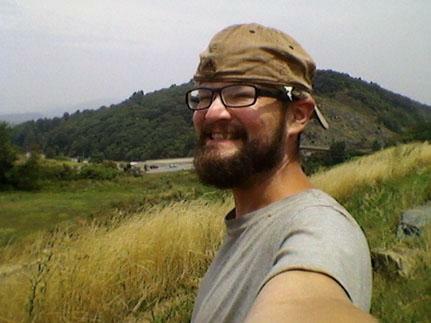 The Federal Bureau of Investigation (FBI) is offering a $10,000 reward for information leading to the arrest and conviction of whoever killed Scott A. Lilly, 30, of South Bend, Ind., last summer near the Appalachian Trail in central Virginia. Lilly’s younger sister, Alysen, joined Sheriff L.J. “Jimmy” Ayers III in urging anyone with information to call the FBI tip line at (800) 261-1044. Chimney Tops Closure: Two Years or Just One? Last week officials from Great Smoky Mountains National Park announced additional details on the upcoming Chimney Tops reconstruction project. As has been known for several weeks now, the popular trail will be closed each Monday through Thursday, from April 30th through October 18th. However, I thought the most intriguing piece of news from the park press release was the fact that the project will take two seasons to complete. My guess is that the vast majority of people that hike this trail already do so on the weekends, so this will have little or no impact on them. However, there is a certain percentage of people that will have to make other arrangements, not only this year, but next year as well. My question for all of you is if you think that the hiking community, park visitors, work crews, and even the park itself, would've been better served by shutting down the entire trail everyday this year, and possibly knocking out the much needed project in only one season? I'm sure there was debate among park management about this issue, but the public was never brought into that discussion. Great Smoky Mountains National Park today announced a new reservation system for the Elkmont Firefly Viewing event beginning in 2012. The popularity of the firefly event has increased significantly over the past several years, prompting park officials to re-evaluate the effectiveness of managing the event on a first-come-first-served basis. Every June, thousands of visitors gather near the popular Elkmont Campground to observe the naturally occurring phenomenon of the Photinus carolinus; a firefly species that flashes synchronously. In 2005, the Park began closing the Elkmont entrance road each evening and operating a mandatory shuttle bus system to and from the viewing area to provide for visitor safety, resource protection and to enhance the experience for both viewers and campers at Elkmont. In 2011, over 7,000 people rode the mandatory shuttle system from the Sugarlands Visitor Center parking area to Elkmont to view the fireflies. As the popularity has increased each year firefly watchers have begun to arrive earlier and earlier. Last year visitors started arriving in the parking lot as early as 2:00 p.m. in order to ensure they would be able to ride the shuttle that transports visitors to the viewing area beginning at 7:00 p.m. Visitors who have traveled from long distances have had to be turned away simply because the parking lot was full and general park visitors have not been able to access the Visitor Center due to the lack of parking. For this year's viewing event, which runs from Saturday, June 2 through Sunday, June 10, a new on-line ticketing system, operated through www.recreation.gov, will provide visitors with parking passes to guarantee they will be able to park at Sugarlands Visitor Center, but without the inconvenience of having to arrive hours in advance. The Park expects the new system will result in improvements in visitor service. A parking pass will be required for all vehicles. A reservation fee to receive the pass will cost $1.50 and will cover a maximum of 6 persons in a single passenger vehicle (less than 19 feet in length). Four passes for oversize vehicles, like a mini bus (19 to 30 feet in length and up to 24 persons), will also be available. Parking passes will be non-refundable, non-transferable, and good only for the date issued. There is a limit of one parking pass per household per season. Each reservation through www.recreation.gov will receive an e-mailed confirmation and specific information about the event. The shuttle service will be the sole transportation mode for visitor access during this period, except for registered campers staying at the Elkmont Campground. Visitors will not be allowed to walk the Elkmont entrance road due to safety concerns. The majority of parking passes for this year's event will be on sale on-line beginning after 10:00 a.m. April 30. The Park will hold back 25 passes for each day to accommodate individuals who did not learn of the need to pre-purchase tickets. Those last 25 passes will go on sale on-line at 10:00 a.m. the day before the event and will be available until 3:30 p.m. on the day of the event or until the passes are all reserved. Passes can be purchased at www.recreation.gov. Parking passes may also be obtained by calling 1-877-444-6777, but Park officials strongly encourage the use of the on-line process, because it provides far more information to visitors about what to expect when they arrive at the Park. The $1.50 reservation fee covers the cost of processing the requests for the passes. The Park will not receive any revenue either from the reservations or the shuttle tickets. In 2011, more Americans participated in outdoor recreation activities than in the past five years – perhaps signaling a move toward healthier, active lifestyles. More than 141 million Americans, or 49.4 percent of the U.S. population, participated in outdoor activities last year – reflecting an increase of three million people compared to 2010 and continuing a five-year trend. In addition, Americans made a total of 11.6 billion outdoor outings in 2011, which is 1.5 billion more than the previous year. Annually, participants averaged 82 outdoor outings – from hiking to biking, skiing to paddling. The findings are part of the 2012 Outdoor Recreation Participation Topline Report, the leading report tracking outdoor participation trends in United States published by The Outdoor Foundation. The research shows increases in youth and young adult participation – continuing an encouraging, yet modest, trend over the last few years. The study found that outdoor participation increased by one-percentage in every age bracket, 6 to 12, 13 to 17 and 18 to 24 respectively. This accounted for more than four billion outdoor outings for the younger generation with an annual average of nearly 90 outdoor outings. While encouraging, these rates are significantly lower than those recorded in 2006. For example, 63 percent of youth ages 6 to 12 participated in outdoor recreation in 2011, compared to 78% in 2006. The most popular activities among young people, in terms of overall participation, continued to be running, biking, camping (20.6%), fishing and hiking (12.9%). Skateboarding, triathlons and bird-watching were among their top five favorite activities as measured by frequency. In terms of growth over the prior year, hiking ranked 10th among all outdoor activities, which reported a 6% increase over the prior year. Kayaking, which ranked 1st, jumped 27% over 2010. Another interesting statistic occurred in backpacking. The activity seemed to be going through a revival of sorts between 2008 and 2010, but dropped off sharply in 2011. Published annually by The Outdoor Foundation with research support from the Department of Recreation, Park & Tourism Sciences at Texas A&M University, the 2012 Outdoor Recreation Participation Topline Report is derived from almost 40,000 online interviews conducted in January 2012/early February 2012. Respondents came from a nationwide sample of individuals and households from the U.S. Online Panel operated by Synovate. Over-sampling of ethnic groups took place to boost response from typically under-responding groups. The 2012 Outdoor Recreation Participation Topline Report is available here. According to the press release, detailed information concerning all the trends in the 2012 Outdoor Recreation Participation Report will be released soon. The Appalachian Trail Conservancy (ATC) will celebrate the official designation of Bland County, Virginia as its newest Appalachian Trail Community™ on May 26th at the Bland County Fairgrounds. A full day of celebratory activities is planned as a part of the county’s inaugural Festival of Trails. Starting at 10:00am, guided hikes along the Appalachian Trail (A.T.) with the local Piedmont Appalachian Trail Hikers club and a bike race through the county will kick off a day of music and dance, followed by the A.T. Community designation ceremony at 5:30pm at the Bland County Fairgrounds. Local volunteers are working collaboratively to bring awareness to the Trail and to the communities about the national resource. The ATC and community leaders will speak, with a proclamation-signing and an unveiling of new community signs. The Appalachian Trail Community™ designation is a new program of the ATC, the nonprofit responsible for management and protection of the estimated 2,185-mile Appalachian National Scenic Trail. Launched in 2010, this program recognizes communities for their part in promoting awareness of the Appalachian Trail as an important local and national asset. Glacier Country Montana is giving you a chance right now to win a five-day, four-night vacation getaway to Western Montana’s Glacier Country. The lucky winner will receive a trip for two to the heart of Glacier Country with destinations that include Whitefish and Glacier National Park. The prize package includes airfare (up to $600), double occupancy accommodations, a rental car, red bus tour for two, trail ride for two, zip line adventure for two, raft trip for two, guided hike for two, whiskey tasting for two (must be at least 21 years old) and a gas card (approximate retail value: $3,000). To enter, simply visit the Glacier Country website and sign-up by April 31st. To help out with some planning on some additional hiking while you're in the park, be sure to visit our new sister website for hiking trails in Glacier Park. The Great Smoky Mountain National Park’s more than 800 miles of foot and horse trails are as lovely and varied as any you’ll find east of the Mississippi. Although the Alum Cave Trail to the summit of Mt. LeConte is certainly one of the more exciting and popular ones here, the other trails also have much to offer, whether it’s a tramp along a rushing mountain creek or just a quiet stroll through the woods, everyone can find something to like about the Smokies. One possibly less known fact about these trails is that many of them, especially those in the lower elevations, will take you back through history. When you walk these trails, scan around you and don’t keep your eyes trained exclusively on the trail in front of your feet. If you do this, you’ll be treated to relics of the old-timey settlers who lived, loved and died here before the Smokies became a national park. Hiking along, I have often encountered the remains of old stone walls, foundations of cabins, and spring houses made of rocks. However, you might be surprised to know that about 100 old cemeteries also exist within the park boundaries. I have almost literally tripped over old marker stones while exploring down a faint side trail. Many of these markers are nothing more than small rocks set in the ground. If any inscriptions had ever been placed on them, erosion has long since effaced them. Quite a few of the burial grounds that can only be reached by taking a longer trail through the woods to the little side trail are very small, having less than a dozen markers maybe. One observation that has lodged itself in my memory over the years is the number of babies buried in these sad little places. 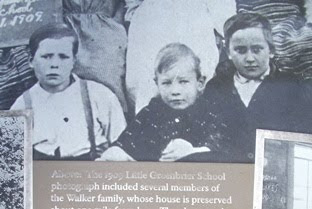 When you can find stones with still-legible inscriptions, you can’t help but notice how many are of children who were born in the winter but did not make it to the promise of spring. We have a tendency, I think, to glamorize early pioneer life, but it was no bowl of cherries, not in the Smoky Mountains certainly. Life was hard for most people, especially in the winter. One cemetery I encountered near the trail to Ramsay’s Cascades had two markers side by side: one of a baby that died one winter and the other of his sibling who died the next winter. How heartbreaking that must have been! We take our modern appliances so much for granted. Try to imagine, for a moment, what your life would be like if you had no electricity, no indoor plumbing, no cars or trucks, certainly no television or computers. Just trying to eke out a living, little by little, day by day, most days probably just like the ones before them. However, let’s end on a more upbeat note. I’ll bet you don’t know what one of the earliest Gatlinburg tourist attractions was. I once picked up an old Smoky Mountain booklet that showed a photo of a wagon loaded with tourists being pulled down the road by a cow!! Yup, that’s exactly right. My, how times have changed! For the hiker, probably one of the best trails for "walking through history" is the Old Settlers Trail off Rt. 321 east of Gatlinburg. About 16 miles long, one-way, this trail meanders along the flanks of the mountains, connecting the trail to Albright Grove and the road to Ramsay Cascades. Then there's always Cades Cove in the northwest quadrant of the Park with its series of short, easy trails leading to reconstructed cabins and homesteads. or my website at http://www.aakemp.com/. Great Smoky Mountains National Park is hosting a star gazing event on Saturday, April 28 at one of Haywood County's clearest views of the sky - Purchase Knob, home to the Appalachian Highlands Science Learning Center in Great Smoky Mountains National Park. The Astronomy Club of Asheville will lead an exploration of the night sky at this high elevation site with a 260 degree unobstructed view of the sky. Visitors can expect to see the 1st quarter moon and the planets Venus, Jupiter and Saturn, which have been so bright in the night sky in recent weeks. "National Park areas often offer a wonderful opportunity to stargaze," says park superintendent, Dale Ditmanson. "Visitors are often amazed at the amount of stars that can be seen simply by venturing out of the well-lit communities and into the natural darkness of Great Smoky Mountains National Park. National Parks across the country have begun to monitor and manage for natural night sky conditions in much the same way as we would to protect our air and water." The event starts at 8:00 pm with an orientation at sunset. The Learning Center is located at 5,000 feet in elevation so please bring warm layers. Reservations are required and can be made by calling the park directly. Purchase Knob is located off US 276 near Maggie Valley, North Carolina. It is not recommended to use a GPS or an internet map service to find Purchase Knob but the park staff can provide reliable directions. Please call (828) 926-6251 for both directions and reservations. This star gazing event is being held in conjunction with the North Carolina Science Festival, a series of events promoting the wonders of science throughout the state from April 13-29, 2012. Please visit http://www.ncsciencefestival.org/ for a complete list of events. Who knew that Italians were eating energy bars 800 years ago? This may explain why they've done so well in cycling over the last century! Earlier this week the GearJunkie announced on his blog that CLIF Bar will be rolling out a limited edition energy bar in May, based on “a traditional 800-year-old Italian recipe”. The bar, called Gary’s Panforte, was named by the company founder, Gary Erickson, who apparently became inspired by the recipe while bike touring in Italy. The bar is based off the traditional Italian dessert panforte, which is a type of fruit and nut cake. When I first heard about this it immediately reminded me of Ta Henket, a limited edition beer from Dogfish Head that uses ingredients and traditions found on ancient Egyptian hieroglyphics. The beer is made from wheat and loaves of hearth-baked bread, and is flavored with chamomile, dom-palm fruit and Middle Eastern herbs. Well over a year ago I saw the founder of Dogfish Head on some reality show as he was gathering the ingredients for the beer while visiting Egypt. Although it sounds very interesting, and would love to try it, I haven't seen it for sale yet. Great Smoky Mountains National Park is teaming up with the Balsam Mountain Trust for a special program on Birds of Prey at the Oconaluftee Multipurpose Room on Thursday, April 26. Michael Skinner, Executive Director of the Balsam Mountain Trust, will conduct an hour-long Birds of Prey program beginning at 1:00 pm. This program will provide visitors with an up-close glimpse of some of the planet's most recognized and revered wild animals such as the tiny eastern screech owl and northern bald eagle. The Oconaluftee Multipurpose Room is adjacent to the Oconaluftee Visitor Center on U.S. Highway 441, 2 miles north of Cherokee, North Carolina. 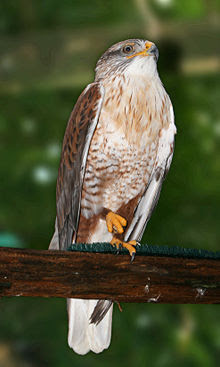 For more information on the upcoming Birds of Prey program, please call the park's Oconaluftee Visitor Center at (828) 497-1904. Officials at Great Smoky Mountains National Park have announced that the popular Chimney Tops Trail will be closed each Monday through Thursday from Monday, April 30 through Thursday, October 18 while the trail undergoes a major facelift. The Chimney Tops Trailhead is along Newfound Gap Road about 8 miles south of the Park's Gatlinburg, TN entrance. The work is expected to take two seasons to complete. The Park's Trails Forever Crew and will be rebuilding the trail using rock and timber. The planned work includes: Constructing rock steps to carry hikers up the steepest areas and prevent erosion; building elevated "turnpikes" - logs laid parallel and packed with dirt, to carry the trail across wetland areas, and creating numerous "waterbars" - logs or stone partially buried diagonally across the trail to divert rainwater off the trail before it can erode the walking surface. Park managers say that the extensive use of durable stone and rot-resistant black locust timbers in the reconstruction will stabilize the trail for decades to come, reducing annual maintenance, and greatly improving the visitor experience. According to Tobias Miller, the Foreman of the Park's Trails Forever Crew," Because of the narrow trail corridor, and steep drop-offs along the edges of the trail, we could not get the work done safely or efficiently with hikers streaming through. Much of the needed work involves moving and breaking large rock which will require extensive rigging of cable systems that will make the trail virtually impassable. Trying to accommodate hikers through the work zones with this type of work underway would be hazardous." The Park's professional Trails Forever crew will also be reinforced by volunteers who sign up to work with the crew on scheduled workdays, as individuals or part of organized groups. The Park invites interested trail work volunteers to visit the Trails Forever website or contact Trails & Facilities Volunteer Coordinator at (828) 497-1949 for more information. Thru-hiking: What does it really take? Everyone has seen videos and photos of hikers trekking on one the three great long-distance trails: the Appalachian Trail, Pacific Crest Trail or Continental Divide Trail. Most of those images highlight the incredible beauty of the trails. But what is it really like to thru-hike a long-distance trail? What does it really take? The Appalachian Trail Conservancy (ATC) is currently searching for volunteers, 18 and over, to help maintain the Appalachian Trail (A.T.) through their Konnarock and Smokies Wilderness Elite Appalachian Trail Crew (S.W.E.A.T.) programs. No previous Trail experience is required - just a desire to work hard, live in the backcountry and have a great time among new friends. All food, tools and equipment will be provided at no cost. The Konnarock Crew was founded in 1983 and named after its original base camp in southwest Virginia. The crews work on the A.T. from Rockfish Gap, near Waynesboro, Virginia, to the Trail's southern terminus at Springer Mountain in Georgia. The program is a joint venture among the ATC, the 12 southern Trail clubs, the U.S. Forest Service, and the National Park Service. Crew members spend 5 days at a project campsite, working 8-hours a day, on Trail related work. The ATC S.W.E.A.T. Crew is a mobile crew, carrying all food, tools and camping gear into the heart of the largest and most beautiful managed wilderness area in the east, the Great Smoky Mountains National Park. The crew focuses on the difficult trail problems that occur in the backcountry with the tools they carry in and the materials that they find. 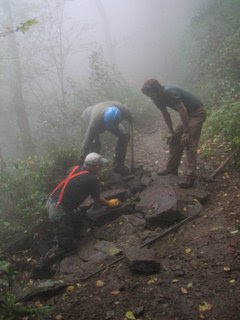 Each crew works six days in the field repairing the Trail, building steps, and clearing the Trail. Both of these all-volunteer trail crews are led by paid trail crew professionals who teach volunteers trail stewardship and Leave No Trace skills during the multi-day adventure. For more information about these Trail Crew programs or to volunteer, please click here. Don’t forget your camera as you head outdoors this spring: the National Natural Landmarks Program annual photo contest is now open and accepting entries. “We’re looking for images that capture the beauty and diversity of these natural areas” said National Park Service Director Jonathan B. Jarvis. Winning photographs will be featured in the 2013 National Natural Landmarks calendar. Contest entries will be accepted through June 30, and each photographer can submit up to three entries. Winners will be announced in September. There are no restrictions on the date of a photograph; however, please remember that “old” slides and prints often lose their quality over time. Each photograph must be from a different national natural landmark. Images of the 13 sites featured in the 2012 calendar will not be accepted. Those winning photos can be viewed here. For full contest information and submission requirements for the ninth annual contest, please click here. There are nearly 600 national natural landmarks nationwide representing an array of natural features. National natural landmarks include features on private, state, municipal, and federal lands. Program participation is voluntary and not all landmark sites are open to the public. National natural landmarks are designated by the Secretary of the Interior following rigorous scientific study. The National Natural Landmarks Program is managed by the National Park Service and recognizes significant examples of biological and geological features and supports the cooperative conservation of these important examples of America’s natural heritage. Further information about the National Natural Landmarks Program, including a complete list of designated sites and their accessibility is available at www.nature.nps.gov/nnl/. 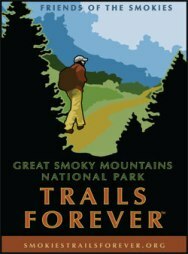 The latest edition of the Friends of Great Smoky Mountains National Park Newsletter is reporting that the Chimney Tops Trail will be the primary project for the 2012 Trails Forever Crew. This trail rehabilitation project will stabilize and improve the trail conditions to protect the resources and enhance the visitor's experience. The Chimney Tops Trail will be closed Mondays through Thursdays from April 30th through October 18th while this work is in progress. The volunteer workdays for this project will begin in May. To support the work of the Trails Forever crew, you can donate online at any time through Friends' website. And through a matching grant from the Aslan Foundation of Knoxville, your dollars will be doubled. Beginning on May 23rd, you can also help by joining the crew on Wednesdays throughout the year. Volunteers will work to complete a variety of trail rehabilitation tasks. There will be a limit of the number of volunteers for each of the workdays and you must sign up in advance to volunteer. Once you sign up and secure a spot for one of the workdays, you will receive more details. To sign up, contact Christine Hoyer, Trails & Facilities Volunteer Coordinator at 828-497-1949 or christine_hoyer@nps.gov. Join Park Ranger Howard Duncan this Saturday, April 21, for a delightful hike along the Big South Fork River looking at the spring wildflowers. You will certainly see some of the more common spring wildflowers and may discover some uncommon ones as well. Wear comfortable walking shoes; bring your wildflower guide, your camera and your interest in discovering nature. For those wanting to bring along their lunch, the Angel Falls Rapid is a beautiful place to enjoy a picnic. The hike is an easy four mile round-trip to the Angel Falls Rapid and back to Leatherwood Ford. Meet Ranger Duncan at the Leatherwood Ford gazebo at 10:00 a.m. Eastern Time. Also this Saturday, Park Ranger Sue Duncan will lead a group horse ride in search of spring wildflowers. For more information on these two events, please click here. 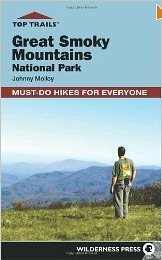 Tennessee native and veteran hiker, Johnny Molloy, has just published a brand new hiking guide for the Smokies. Top Trails: Great Smoky Mountains National Park contains a comprehensive sampling of 50 "must-do hikes" in America’s most visited national park. These "must-do" hikes represent every stunning feature of the area; from the park’s classic destinations to lesser-known jewels; from secluded mountain waterways to awe-inspiring views from grassy balds. The trails range from an easy family stroll to a soothing stream, from a 7 mile trek through spruce forest atop a peaceful ridge, to a panoramic 22 mile overnighter. For more information from Amazon (and to save 33%), please click here. Great Smoky Mountains National Park announced the 8th annual "Music of the Mountains" celebration, which will be held this year April 20th through the 22nd. Over the years, this event has grown to span an entire weekend, with performances of traditional music in neighboring communities, including an entire day of free music at the Sugarlands Visitor Center on April 21st. The three-day event begins with a concert of Celtic music by the Good Thymes Ceilidh Band on Friday at 7:00 p.m. at the Great Smoky Mountain Heritage Center in Townsend, Tenn. General admission is $5. The "Music of the Mountains" program continues on Saturday with a series of free performances of old-time mountain music during the day at the park's Sugarlands Visitor Center. Back again this year will be a Sunday afternoon program at the Smoky Mountain Visitor Center in Cosby, Tenn., where traditional Appalachian religious music will be showcased. General admission is $4. At Sugarlands Visitor Center, six programs are planned from 10 a.m. to 4 p.m. (see schedule below). They are all free of charge and open to the public. The students of the East Tennessee State University Old Time Band will be performing at the event for the very first time this year. The group will play two sets, at 2 and 3 pm. "The park has offered the 'Music of the Mountains' festival since 2005 to share with our visitors the region's rich musical traditions of the era before modern bluegrass and country music," said supervisory park ranger Kent Cave. "We are delighted to continue partnerships with our neighbors in Cosby and Townsend that present various types of music played here in the southern mountains," said Cave. Last week the U.S. Forest Service announced that part of Wolf Laurel Road in the Nantahala National Forest will be closed as improvements are made to the road from April 15 thru mid-October. The project will enhance fish habitat by replacing two culverts, while performing other road repairs. Wolf Laurel Road will be closed from the Swan Cabin Road intersection to the Wolf Laurel Trailhead, approximately the last two miles of the road, from mid-April to Oct. 15. Hikers and other forest users who wish to reach the Wolf Laurel Trailhead can park at the road closure and walk to the trailhead or access the Joyce Kilmer-Slickrock Wilderness through other trailheads. Alternate trailheads include Beech Gap, Rattler Ford, Joyce Kilmer Road and Maple Springs. The existing culverts prevent brook trout from migrating to spawning areas upstream. Brook trout are the only trout native to much of the eastern United States. The Forest Service will install new culvert structures as part of a joint restoration project with the Eastern Brook Trout Joint Venture. The new culvert structures will provide fish passage to trout spawning areas upstream. Portions of the road will be re-opened as work is completed. The Forest Service estimates that the entire road will open by mid-October. For additional information, contact the Cheoah Ranger District at 828-479-6431. • Chimney Tops Trail is scheduled to be closed on Mondays through Thursdays, April 30 - October 18, 2012 for trail rehabilitation. • Beard Cane Trail is closed due to tornado damage. • Hatcher Mountain Trail - North of its intersection with Little Bottoms Trail is closed due to tornado damage. • Gunter Fork Trail closed due to landslides. • Caldwell Fork Trail - several footbridges along the trail are damaged. Hikers wishing to use the trail will need to ford the creek. The foot bridge located between the trailhead and the second junction with the Boogerman Trail is out and is scheduled for repair in May. • Smokemont Loop Trail/Bradley Fork Trail - the foot bridge located at the junction of these trails is out and scheduled for repair in May. • The Laurel Falls Trail continues to have an active bear warning. To keep up with all the latest closures and warnings in the Smokies, please click here. A number of recreation and camp sites in the Nantahala and Pisgah National Forests will be openning over the next several weeks. 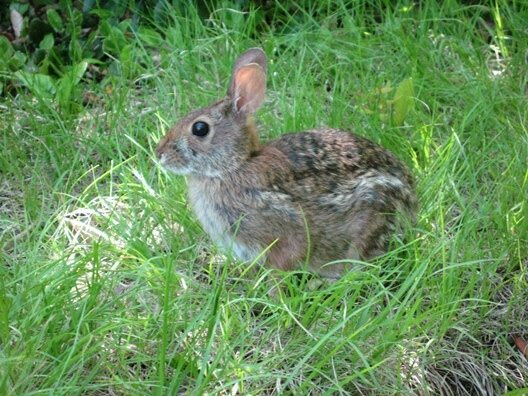 The following is a list of sites that open April 1. For more information on these and all sites in the Nantahala and Pisgah National Forests, please click here. The Friends of the Blue Ridge Parkway Asheville Chapter is sponsoring Spring Improvement Projects at The Mount Pisgah Campground on Saturday, April 21st and/or Saturday, April 28th. Lunch for all volunteers will be provided by Chick-fil-A! The goal for the project is to get the campground ready for visitors this season by cleaning up debris, leveling any erosion on campsites, and installing bear proof lockers. Opening day for the campground is May 15th, 2012. The Mt. Pisgah Campground is located at mile post 408 on the Blue Ridge Parkway - across from the Pisgah Inn. If interested, or would like more details, please visit the Friends website AVLfriendsBRP.com. You can confirm plans by phone or email to Hugh W. Stephens, Asheville Chapter Chair at (828) 274-9048 or hwstephens@bellsouth.net. On the evening of March 31st, rangers were dispatched to the Craggy Gardens picnic area in response to a 911 call concerning a probable drug overdose. Upon arrival, they found a man and woman parked in a vehicle, both exhibiting an altered mental status. They said that they’d ingested psilocybin mushrooms, with the woman adding that she was dead and had no pulse. Blue Ridge Parkway Rangers and EMS personnel began an assessment and noted that the woman was suffering from periodic convulsive events. At one point, she jumped from the stretcher, climbed into the rear seat of a patrol car, exited again, dropped to the ground, and experienced another convulsion. She was eventually placed in an ambulance, where she was transported to a hospital for treatment and evaluation. During the transport, she continually asked if she was alive or dead and if what was happening was real. Rangers remained at the hospital until she returned to a coherent state. Both the man and woman were issued violation notices for using a controlled substance. The driver was released to the custody of his father. The 911 call actually originated from the couple, who were concerned that they were already dead. Commonly referred to as “America’s best idea,” the national parks are awe-inspiring places that provide a deep connection to our country’s heritage, and to nature. But threats to the parks and to their funding are impacting park wildlife, water and air quality, and require our attention and support. Leading granola bar brand, Nature Valley® is a longtime supporter of national park preservation through its “Preserve the Parks” program – now in its third year – which benefits the National Parks Conservation Association (NPCA). Over the course of the three-year relationship, the Preserve the Parks program will have helped raise more than $1 million to benefit restoration projects in support of America’s national parks. This year, Nature Valley is continuing to help preserve America’s national parks while encouraging education, outdoor exploration and support. To get the 2012 Preserve the Parks program started, Nature Valley is making a $300,000 donation to the NPCA and is inviting consumers to help raise an additional $200,000 by entering the Universal Product Codes (UPC) from specially-marked packages of Nature Valley products at PreserveTheParks.com. This year, in celebration of National Park Week (April 21-29), consumers are invited to visit the Nature Valley Facebook page and “Like” designated posts during that week to help trigger additional donations to the NPCA – $1 per “Like,” up to $50,000. • Acadia National Park: Constructing a connector trail to provide better access to Acadia National Park. • Everglades National Park: Improving public access to, and providing greater awareness about the Everglades and Everglades National Park. • Grand Teton National Park: Protecting wildlife migration corridors near Grand Teton National Park. • Great Smoky Mountains National Park: Restoring land and wildlife habitats to benefit Great Smoky Mountains National Park. • Joshua Tree National Park: Ensuring healthy ecosystems to benefit the wildlife of Joshua Tree National Park. • Yellowstone National Park: Restoring pronghorn migration routes around Yellowstone National Park. For more information, to volunteer, or make a donation, please visit PreserveTheParks.com. The U.S. Forest Service announced yesterday that there is a high threat of wildfire this week in the Nantahala, Pisgah, Uwharrie, and Croatan National Forests and encouraged visitors to help prevent wildfires. Dry conditions are increasing the chances of wildfire across North Carolina. * Clear a 10-foot safety circle of all leaves, pine needles and flammable material. * Allow the wood to burn completely to ash, if possible. * Pour lots of water on the fire, drown ALL embers, not just the red ones. * Pour until hissing sound stops. * Stir the campfire ashes and embers with a shovel. The U.S. Forest Service is also asking residents to postpone burning debris this week. Debris burning is a major cause of wildfires in the South. * Don't play with matches. * Keep your cigarette butts in the car. * Park vehicles so that the exhaust system does not come in contact with dry grass, weeds or leaves. Tennessee Gov. Bill Haslam has proclaimed April 9–15 Tennessee State Natural Areas Week, and Tennesseans are encouraged to join in a weeklong celebration with activities such as wildflower hikes, canoe trips, guided tours and volunteer efforts. The State Natural Areas Program provides long-term protection for rare, threatened and endangered plant and animal life. The program also protects ecologically sensitive areas, areas of geological and archaeological interest, and areas of great scenic beauty. First established in 1971 by the Tennessee Natural Areas Preservation Act, there are now 82 state natural areas. The week includes a full schedule of events in many of these 82 natural areas, with approximately 63 programs planned across the state. A wide variety of interesting activities – including raptor and reptile programs, and several guided wildflower and birding hikes – are planned to engage Tennesseans in appreciating and enjoying these public areas. For a complete schedule of events and trip details, please visit the Division of Natural Areas’ website at www.tn.gov/environment/na/events/seasonal.shtml, or call (615) 532-0431. Please note that some activities require reservations. More than 800 miles of trails await your exploration in Great Smoky Mountain National Park. But where to start? What to bring? And what about those bears? Those questions and many more will be answered at a free presentation offered by the Friends of the Smokies at REI. From a leisurely stroll along the Oconaluftee River to a two night backpack along the Apalachian Trail, Friends of the Smokies' adventurous panel is comprised of experts on the great variety of trails in the Smokies - including members of the 900 Miler Club, who have hiked every trail in the Great Smoky Mountain National Park. They will give you the inside scoop on how to prepare, how to get there, and what to expect so you can have fun. This panel discussion will be held on 4/25/2012, from 7:00 p.m. - 8:15 p.m. at the REI in Asheville. For more information, and to register, please click here. Agriculture Secretary Tom Vilsack today announced the U.S. Forest Service will dedicate $40.6 million for 27 exceptional land acquisition projects in 15 states that will help safeguard clean water, provide recreational access, preserve wildlife habitat, enhance scenic vistas and protect historic and wilderness areas. Projects funded are in Alaska, California, Colorado, Georgia, Idaho, Indiana, Michigan, Missouri, Montana, New Mexico, North Carolina, Oregon, Tennessee, Utah and Washington. Projects range from protecting nationally significant lands from threat of residential development in North Carolina to help pave the way to help purchase the largest single parcel of privately held land with the Kootznoowoo Wilderness on the Tongass National Forest in Alaska. The money is made available through the Land and Water Conservation Fund, created by Congress in 1964 to provide funding to federal, state and local governments to purchase land, water and wetlands. The fund receives the majority of its money through royalty payments from offshore oil and gas revenues to mitigate the environmental impacts of those activities. Those funds also are augmented by additional money or in-kind services of a variety of partnerships. * $5 million has been appropriated for Rocky Fork in the Cherokee National Forest: This acquisition will provide protection for what was recently one of the largest contiguous tracts of private forest land in the East. The Forest Service identified Rocky Fork as a “national priority” because of its high natural resource values and recreational opportunities including a portion of the Appalachian Trail, blue-ribbon trout fishing, and a variety of recreational activities such as wildlife watching, rock climbing and hunting. * $1 million towards lands adjacent to National Forests in North Carolina: Nationally, land managed by the National Forests in North Carolina rank second in recreation visits but are among the most vulnerable to adjacent commercial and residential development. Forest fragmentation is a major issue and the acquisition will help to ensure recreation access, ecological integrity and watershed values on adjacent federal lands and for downstream resources. * $2 million has been appropriated to protect areas near the Chattahoochee-Oconee National Forest: Georgia’s national forests are near population centers numbering in the millions, creating tremendous pressures for clean water and recreation on the nearby public lands. These acquisitions focus on providing recreation opportunities and protecting watershed and wetlands in an area where the viability and availability of clean, abundant water is critical. To see all of the projects approved for funding in 2012, please click here. Last week the National Park Service announced that revenue from leases for offshore oil and gas development in federal waters helped states build or improve 198 parks across the country in 2011, ranging from establishing a new park on Texas’ most pristine river, to protecting and providing public access to prehistoric petroglyphs in Wyoming to building a new wheelchair-accessible playground in Indiana, according to a new report issued by the Interior Department’s National Park Service. Under the Land and Water Conservation Fund State and Local Assistance Program, the Park Service awarded $33.3 million in grants to states to help communities invest in new parks or renovate or expand existing parks. States, local communities, and other partners exceeded the required dollar-for-dollar match by providing $43.9 million to complete the projects. Through the fund, a portion of the revenue derived from oil development of federal lands is shared with local communities to provide recreational opportunities for the public. The grants must be matched by partners at least a dollar-for-dollar. To review some of the projects that received funds, please click here. The Appalachian Trail Conservancy (ATC) announced yesterday the recipients of this year’s North Carolina Appalachian Trail (A.T.) License Plate grants for projects which enhance the Appalachian National Scenic Trail in North Carolina. $35,000 was granted this spring to twelve individuals and partner organizations including Trail clubs, schools, botanists and ecologists, environmental & conservation groups, and civic organizations. Overall, A.T. specialty license plate sales in North Carolina bring the ATC about $120,000 each year. This year’s recipients are the Baatany Goat Project, East Tennessee State University (in regards to two botanical research projects), Friends of the Smokies, Hot Springs Tourism, Nantahala Hiking Club, Southern Appalachian Highlands Conservancy, Southern Appalachian Raptor Research, SouthEast Ecological Design, Summit Charter School, Tennessee Eastman Hiking & Canoeing Club, and The Wilderness Society’s Southern Appalachian Wilderness Stewards. This grant program is funded by drivers who purchase and renew their North Carolina A.T. specialty license plates. Twenty dollars from each license plate is returned to the ATC to support its work in the state. This money is used to fund the grant program, for A.T. greenway acquisition, and to help support the work of the Southern Regional Office of the ATC in Asheville, North Carolina. Hikers and lovers of the Southern Appalachians may be pleased to learn of two brand new books. The first book, released last month by prolific hiking guide author, Johnny Molloy, is called Explorer's Guide 50 Hikes on Tennessee's Cumberland Plateau. 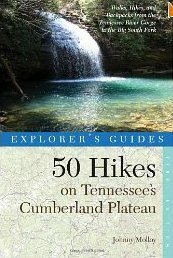 This new release details 50 hikes on the Cumberland Plateau, including the Big South Fork National River & Recreation Area near Kentucky, the fascinating Walls of Jericho astride the Alabama state line, the thousand-foot gorge cut by the Tennessee River near Chattanooga, Virgin Falls near Sparta, Great Stone Door, Cumberland Mountain State Park, and many other beautiful locations along the plateau. The book also includes comprehensive maps for each hike, scenic photos, and a Hikes-at-a-Glance table that makes choosing your desired hike a breeze. 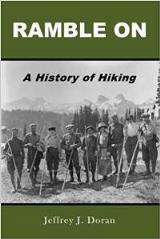 The second book, just released this past Monday, provides more than 200 vintage photographs Along the Appalachian Trail. 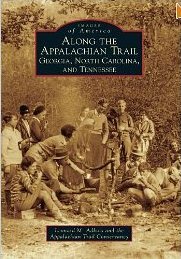 This brand new release focuses on Georgia, North Carolina, and Tennessee, with photos that have been culled from the Appalachian Trail Conservancy, National Park Service, local trail maintaining clubs, state archives, and historical societies. They illustrate the sweat, toil, and dedication that went into building the trail over some of Eastern America's highest and most rugged terrain. Also chronicled are the people who lived along the trail's route, those who volunteered to physically build it or lobby for its creation, and the many relocations that have moved the pathway to optimal locations. The author, Leonard M. Adkins, is no stranger to the Appalachian Trail. He's hiked the entire trail five times, and was a ridge runner for the Appalachian Trail Conservancy at one time. 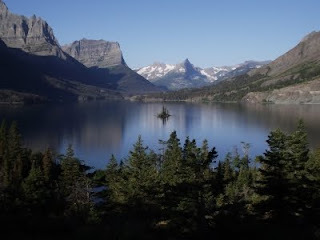 Many people who are unfamiliar, or are making their very first visit to Glacier National Park, want to know what the best day hikes are in the park. Below are my personal top ten hikes in Glacier. Hopefully this will be a helpful starting point as you try to decide where you want to hike during your visit. Highline Loop – This world famous hike should be on the bucket list of any self respecting hiker. The incredible views, the wildlife and the wildflowers, all combine to make this a hike you'll remember the rest of your life. Piegan Pass – Just a notch below the Highline Trail on the“awesome meter”, but far less crowded. Ptarmigan Tunnel – If you’re anywhere near Many Glacier, the hike to Ptarmigan Tunnel shouldn’t be passed up. The highlight of the hike is passing through a 240-foot tunnel that cuts a hole through the Ptarmigan Wall. It was built for horses and early park tours by the Civilian Conservation Corp in the 1930's. After hiking all day in the Many Glacier Valley, walking to the other side of the tunnel is like walking into another world. 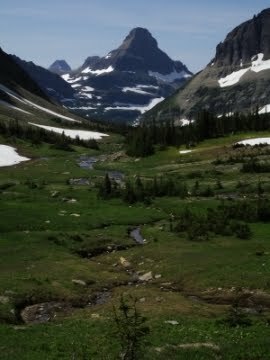 Grinnell Glacier - Another extremely popular hike in the Many Glacier area. This one visits the famous 300-acre glacier that sits just below the Continental Divide. Preston Park - One of my favorite areas in Glacier is Preston Park. It’s a large, incredibly beautiful alpine meadow, located in the valley between Mt. Siyeh and Matahpi Peak (near Logan Pass). Iceberg Lake - One of the most popular hikes in Glacier. And for good reason. This is a great opportunity to see icebergs floating in a gorgeous alpine lake. You’ll also have commanding views of the Ptarmigan Wall, an arête, or thin ridge of rock separating two valleys that have been carved by glaciers. Cracker Lake - Cracker Lake in the Many Glacier area has to be one of the most beautiful lakes in the world. The lake has the most magnificent turquoise color you’ll ever see. If you could ignore the magnificent scenery of the surrounding mountains, it would still be well worth the hike just to see the amazing color of the lake. If it weren’t for the walk through a long section of forest, I would’ve ranked this one a little higher. Pitamakan Pass - Dawson Pass usually gets all the attention in Two Medicine. However, at least for me, I think the views from Pitamakan Pass are much more dramatic. From the knife-edge pass you can see five lakes on either side of you. Scenic Point - The rock outcropping that sits above alpine tundra meadows offers stunning panoramic views of the Two Medicine Valley. On a clear day you can even see the Sweet Grass Hills rising above the Great Plains 90 miles away! Dawson Pass - One of the most popular backcountry hikes in the Two Medicine area is the one up to Dawson Pass. The hike can be shortened to just 9.4 miles by taking the shuttle boat across Two Medicine Lake. 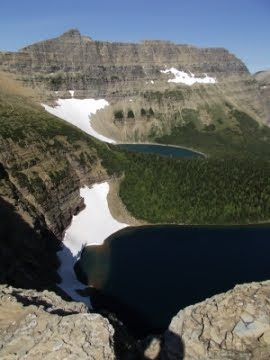 For more information on Glacier National Park, including details on most of the day hikes, accommodations, and other things to do, please visit our new Glacier hiking trail website. Whether you are looking for a long-distance backpacking trip or an exciting day-hike, the Foothills Trail offers an extraordinary opportunity to explore the Southern Appalachians. About 77 miles in length, the Foothills Trail is located along the Blue Ridge Escarpment in Upstate South Carolina and Western North Carolina, and is within easy driving distance of Asheville. Join Foothills Trail Conference Board Member and naturalist, Heyward Douglass for this informative presentation on the Foothills Trail at the REI in Asheville. This free presentation will be held on 4/17/2012, from 7:00 p.m. - 8:15 p.m. For more information, and to register, please click here. I found about Wild: From Lost to Found on the Pacific Crest Trail, a brand new release by Cheryl Strayed, in a book review published in the Wall Street Journal last weekend. Intrigued by the story, I saved the clipping until I could find a little more time to do some research on the book. For more information, and to purchase the book, please click here.